When local businesses succeed, our communities grow. At Heartland Bank, we understand the relationship between small, independent businesses and the communities they serve. Our business banking and lending services aim to help small business owners in our communities succeed, whether it’s by providing a deposit account, online banking or remote deposit capture, or through our various business loan programs. The money from your business has to live somewhere. Why not keep it local? Heartland Bank offers different business deposit accounts that provide quick and easy access to your money, as well as various features. Compare Heartland Bank’s business deposit accounts to find the one that best fits your business’s needs. Make managing your business’s finances easier! With Business Online Banking from Heartland Bank, you can automate your finances and keep them organized in one central, secure place. Learn more about how Business Online Banking can help your business. From SBA loans to commercial real estate loans and revolving lines of credit, Heartland Bank is here to help local small business owners by offering numerous types of financing for their unique needs. See which business loan program your company could benefit from. Stop wasting your valuable time and reclaim your day! With Remote Deposit Capture, you can easily process and deposit your business’s checks directly into your checking account from your office. Learn more about the benefits of Remote Deposit Capture at Heartland Bank. Contact your nearest Heartland Bank office to learn more about these services. 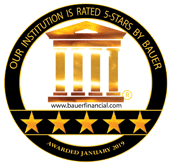 Heartland Bank is honored to have been awarded a very prestigious award from Bauer Financial, Inc., the nation’s leading independent bank rating firm, their highest rating of 5-Stars! We have earned a 5-Star rating from Bauer Financial for 91 consecutive quarters, that’s over 22 years!